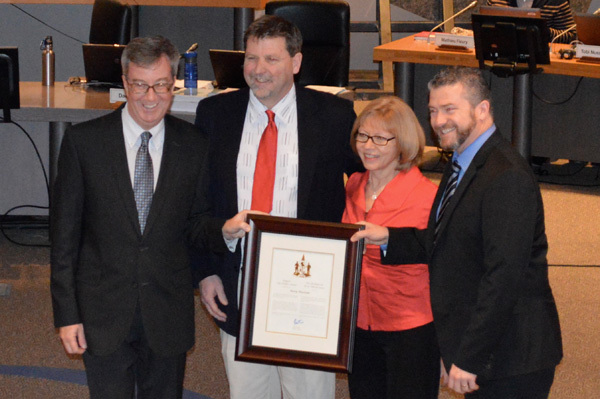 The Mayor his Worship Jim Watson welcomed Kerry MacLean and wife Christina to council chambers toady and along with Councilor Tierny presented the City Buidler Award for his lifelong service to students, athletes and sport in general. Along with his many years of volleyball service MacLean has worked in the North Gloucester Little League, Gloucester-Cumberland Basketball association, Gloucester Soccer Association, and served as chair of the Beacon Hill North Community Association. His involvement in volleyball began as a player in the 1970's, instilling an instant love affair with the sport. In the years since he has taken on many roles in the area and across the province; those as a coach, player, official, regional ADP chair and league convenor (with the school board). His founding of the Maverick Club in 1985 provided him and other avid enthusiasts with a means to improve the quality of play trhoughout the region and create an environment where athletes could thrive and grow under the challenges of sport. The core values of the Maverick Club are derived from a mix of leaders and their influences, however many share these same core values as MacLean and it is what has allowed the club to survive for 3 decades. His worship the Mayor, also spoke of the return of many young adults to the sport and the club where they have continued to pay it forward by working with the next generation of players. Another dimension of which the club is incredibly proud. In his brief acceptence comments Kerry thanked the many who have supported him over the years and especially his family, parents and of course his wife of 30 years. Congratulations from all of us here at the Mavs!